When I started the fan club in October of 2004 I never imagined it would become as massive as it now has. We currently boast over 750 registered Fan Club members from around the world and have Sister Club Chapters in 4 other Florida cities and growing. 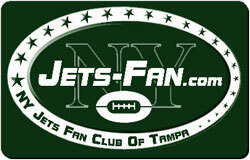 Why not join our Jets family by becoming an official fan club member. It just takes a few moments to register and it’s completely free. 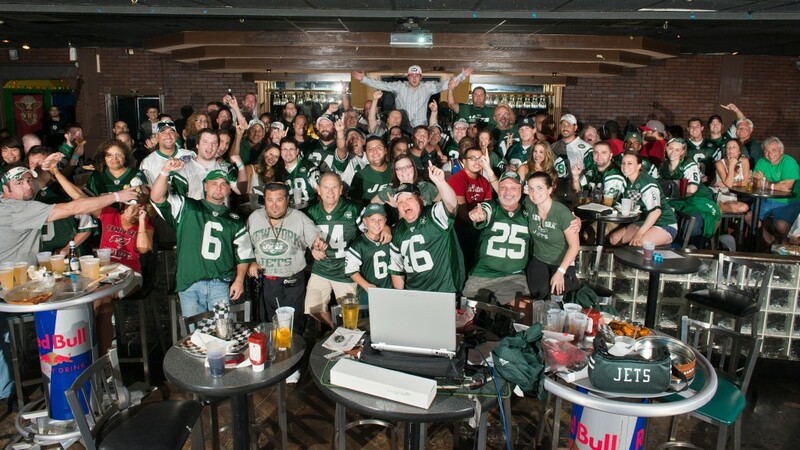 Joining makes you a member of one of the largest New York Jets Fan Clubs in the world and guarantees you’ll never watch another Jets game alone. It also means you’ll never miss out on anything that we’ve got planned. So, what are you waiting for… Join the Fan Club today! Warmest regards and GO JETS! Purchase your Members Discount Card today or. Become a Fan Club business Sponsor. It’s completely FREE. Your Members Discount Card gets you great discounts, specials and deals from our Sponsors (including 10% off at Peabody’s ). NOTE: You do NOT need to purchase a Member Discount Card to become a member of the Fan Club. The Discount Card is just a way for you to save money every week at our fan club’s home bar and other local establishments around town. It also helps support the club so we can continue to provide a fun and exciting environment for everyone to watch the games in. WOW! Another cool first for the fan club… a mention in a book. It’s called ” 100 Things Jets Fans Should Know & Do Before They Die ” by Bill Chastain. Read more about the shout-out Bill gives us and all our other “Claims to Fame” by clicking here or pick up a copy of this fun and fact filled book about the Jets by clicking the photo to your left! 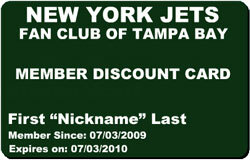 Welcome to Jets-Fan.com , the home of the New York Jets Fan Club of Tampa Bay… if you’re a Jets fan, you’re family! If you live in the Tampa Bay area and wish you had other New York Jets fans to hang out with while you watch your favorite team in action, then what are you waiting for? This is the place for you. Get the latest updates and fan club happenings by clicking here. If you wish to receive updates and other emails about club happenings be sure to join the fan club . Joining the NY Jets Fan Club of Tampa is free and easy… just visit our Membership Page , fill out the short form, then check your email for a confirmation message and click the link included with it. That’s all there is to it. And don’t think you need to live in Tampa to become a member. All you need to be is a Jets fan. Every week the NY Jets Fan Club of Tampa Bay meets at Gaspar’s Patio Bar and Grille where we’ve been graciously welcomed to watch the Jets in their Bourbon Bar. Gaspar’s carries all the NFL games and also has great food and drink specials. We absolutely LOVE Gaspar’s and so will you! Check out our latest newsletters >> . Earl Christy of the NY Jets Superbowl III Championship Team joins us regularly during the season. Earl is a lifetime member of our fan club and is always willing to shake hands, sign autographs and hang out with us to watch the games. Check out the photo’s of Earl’s first visit. Opening day 2007. Treat him nice and maybe he’ll tell you a story about Joe Namath. I hear he likes Chicken Wings too! Note from Festa: It’s been a real treat getting to meet with and to know #45. Read about my initial meeting with Earl on the Fan Club’s Blog. 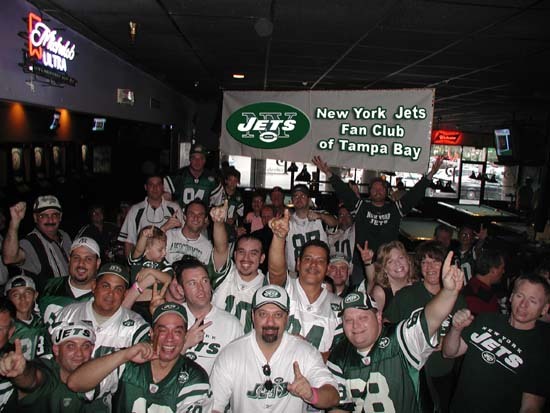 Take a look at how and where we started the club by reading the history of the Jets Fan Club of Tampa Bay. Another great way to find out about the latest Jets Fan Club happenings is to check out the New York Jets Fan Club of Tampa Blog. Every week you’ll find a report on our weekly gatherings, pictures, and other Fan Club related info. Also, don’t forget to check out our Message Board to discuss the Jets with other New York Jets Fan Club members. Be sure to spread the word about the Fan Club as we are an ever expanding and growing group with over 750 members as of November 2018. Let us know if you have suggestions or would like to help out with the website, blog, or marketing . Note: My given name may be Steve but my friends have been calling me Festa for the last 35 years. While I really miss going to all the JETS home games and tailgating with a large group of friends, it’s really great being here in Tampa around other JETS fans while we root for our team. And naturally, whenever the JETS put point on the board, we all join in and do the J-E-T-S, JETS, JETS, JETS chant ! So feel free to browse around the site and enjoy. Remember… if you’re a Jets fan, you’re family!